Surprise! That lovely color on these chicken skewers is actually paprika! We blended the roasted red pepper with mayo and garlic to make the marinade. Thread chicken evenly onto 12 wooden skewers; place in shallow dish. Place mayo, peppers and garlic in blender container; cover. Blend until smooth. Reserve 1/4 cup of the mayo mixture; set aside. Pour remaining mayo mixture over skewers; cover. Refrigerate 30 min. to marinate. Preheat broiler. 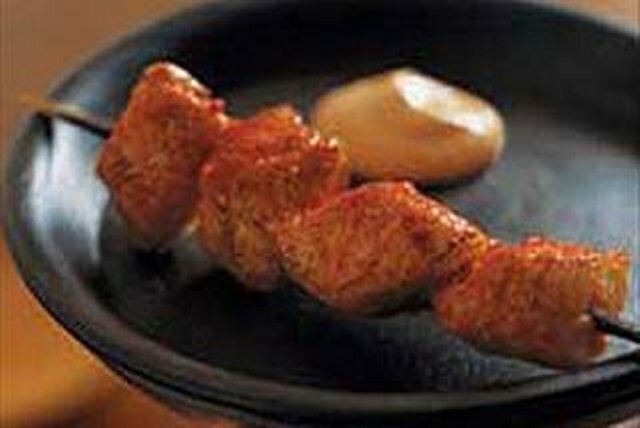 Remove skewers from marinade; discard marinade. Place skewers on rack of broiler pan. Broil 4 to 6 inches from heat for 10 min. or until chicken is cooked through, turning skewers occasionally. Sprinkle evenly with paprika. Serve with the reserved mayo mixture. Arrange whole bell peppers or large chile peppers on foil-covered baking sheet. Place under broiler 2 to 4 inches from heat source. Broil until peppers are blackened on all sides, turning occasionally with tongs. Place in paper bag; close bag. Let stand 20 min. or until peppers are completely cooled. Remove peppers from bag; peel away blackened skin with small sharp knife. Discard skin. Cut peppers lengthwise in half; remove and discard seeds. Substitute 1/3 cup finely chopped jarred roasted red peppers for the roasted fresh red pepper. Substitute any firm-fleshed fish, such as halibut or tuna, for the chicken.